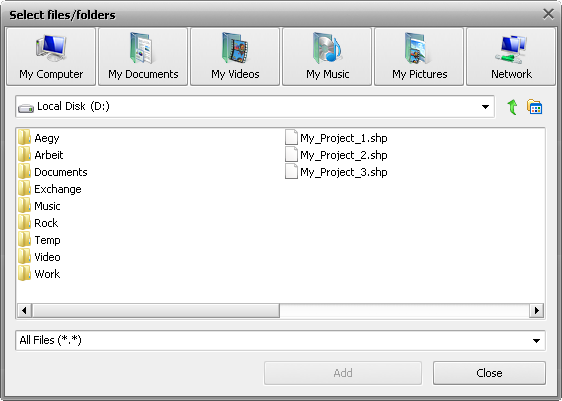 A blank DVD, CD or Blu-ray disc, the disc creator supports all DVD+/-R, DVD+/-RW, DVD-RAM, Double/Dual Layer DVD. The Create Audio CD task is used to write audio files in .cda format to CD. After you install the software, run it and click “Audio” to lunch the Audio Burning Engine. Step 1. First you should load audio files to the application clicking the Add Files button. You can import files in any format, so they will be converted to .cda before disc burning. Step2. In the dropdown list at the top you can select the disc drive you need. Step3. To proceed to the final step, you should press the Start burning! button. If the disc you inserted contains some data, the program will offer you to erase it. If the disc is empty, the imported audio files will be directly converted to .cda format and written to the disc you inserted. If you want to burn data files to DVD or CD for backup, or burn boot disc for software and system installation. click toolbar “Data” to run the data burning engine. Before you start burning your discs you should compile a list of all the files you would like to record onto your disc. You can also drag the files and folders from the standard Windows Explorer and drop them to the Files List Area. In case you are going to record DVD/Blu-Ray-video the Finalize disc setting will be enabled and no change of this setting will be possible. That is done to ensure compatibility with the hardware DVD players. The Joliet structure also cannot be used, as DVD/Blu-ray video discs use only UDF file structure. That’s why the whole section is disabled and the UDF option is checked by default. After all things done, click OK to start the burning process. If you want to make copies of CD, DVD or Blu-ray, you can click “Copy” to luch the copying engine. No data will be changed and no video will be compressed on the target disc as compared to the source disc. 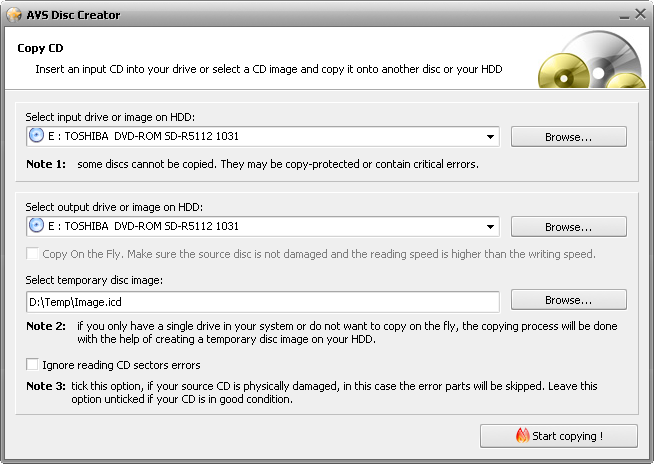 If your computer has two DVD Drives, you can select different drives as input and output, the Copy on the Fly option will become available. By checking it you’ll be able to make a copy of a disc directly, without first saving the source on an intermediate medium (hard disk drive). After you select all the settings click the Start copying! button to start the copying process.